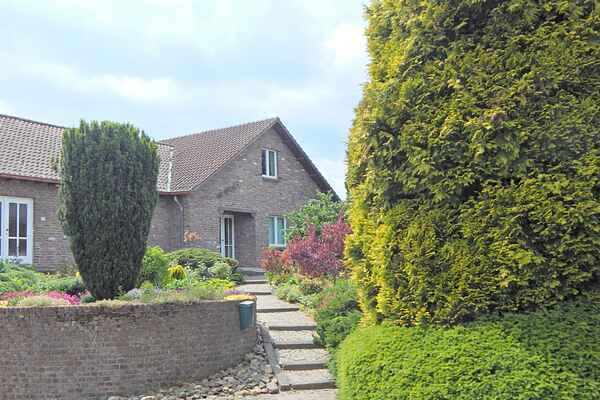 This comfortable holiday home is situated in the small South Limburg village of Sweikhuizen. You'll be renting the left part of the house. You have your own entrance and private terrace in front of the house. You can also use the owner's spacious garden with swimming pool (unheated). In the garden you'll also find a beautiful pond and some playground equipment, like a trampoline. The garden is fully enclosed and therefore safe for children or pets. Inside you'll find a well equipped kitchen, a large bathroom with bathtub and a separate shower. There also is a second shower space and separate toilet. Sweikhuizen is the smallest mountain village of the Netherlands and the area is ideal for walks and bike tours. It's located in a wooded area with many walking trails and guest houses like De Biesenhof, De Bokkereyer and castle Terborgh. De Bokkereyer is only a 2-minute walk away. In the Sweikhuizen area you'll also find the famous Pieterpad (from Pieterburen in North Groningen to Mount Saint Peter in South Limburg) and the Route to Santiago de Compostela. The village is close to Geleen/Sittard, Maastricht, Valkenburg and Aachen.